The IceHogs’ road swing continued in week 2 of the AHL schedule with back-to-back games in Lake Erie against the Monsters this past weekend. After splitting their opening weekend set in the Lone Star State, the Hogs were looking to add to their win total for this season and to continue their streak of sweeping the Monsters; they went 4-0 against them in 2012-13. Friday, October 11 at Lake Erie – The IceHogs looked like the IceHogs of the latter half of last season on Friday night. They opened up a 5-0 lead on the Monsters during the first two periods of play. Sophomore defenseman Adam Clendening tallied 1:28 into the game, followed by veteran forward Brad Mills at 4:26 and rookie center Drew LeBlanc at 7:48; LeBlanc’s marker was his first professional goal of his career. The Rockford offensive onslaught continued at 15:14 of the second period while the Hogs were on the power play as defenseman Viktor Svedberg scored his first AHL goal; defenseman Dylan Olsen and forward Mark McNeill got the assists on the tally. With 3:17 remaining in the middle frame, LeBlanc added his second goal of the game to make it 5-0. The Monsters broke Antti Raanta’s shutout bid in the third period at 2:02 and scored again later on in the frame to make it 5-2. But, the IceHogs were able to hold on for their second win of the season and improve their record to 2-1-0-0. -The IceHogs outshot Lake Erie 32-22. -The Hogs went 1-for-5 on the power play and killed off all 4 Lake Erie man advantages. 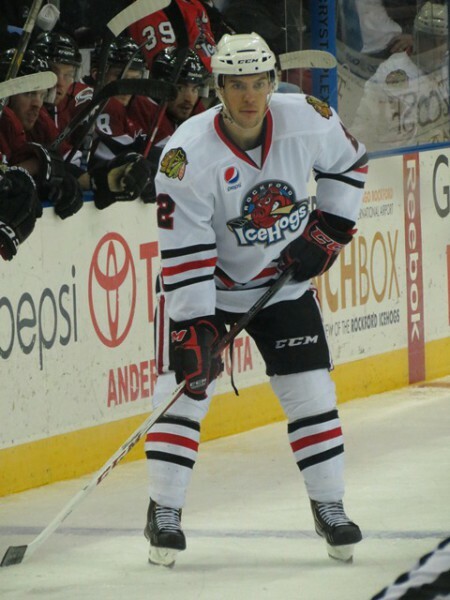 -IceHogs veterans Brandon Pirri and Jeremy Morin led Rockford with 5 shots on goal each. -The IceHogs’ scratches were: Wade Brookbank, Maxim Shalunov and Joe Gleason (healthy). 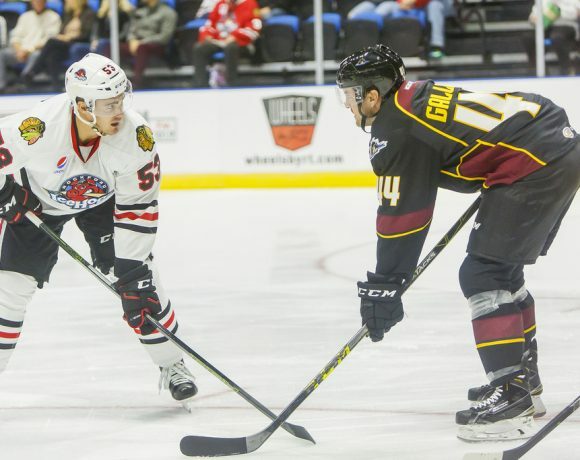 Saturday, October 12 at Lake Erie – Saturday’s contest was a total 180 flip for the IceHogs. The Monsters scored 3:17 into the game and opened up a 4-0 lead by the time the 14:33 mark of the second period rolled around. The Hogs got on the board at 3:18 of the third period with a power play goal from Brad Mills; Alex Broadhurst and Drew LeBlanc set it up for the Terrace, British Columbia native. The Monsters added a shorthanded, empty net goal later on in the period to make the final 5-1. -Lake Erie outshot Rockford 36-31. -The IceHogs went 1-for-5 on the power play while the Monsters went 2-for-7 on the man advantage. –Antti Raanta was in net for Rockford again during Saturday’s tilt. 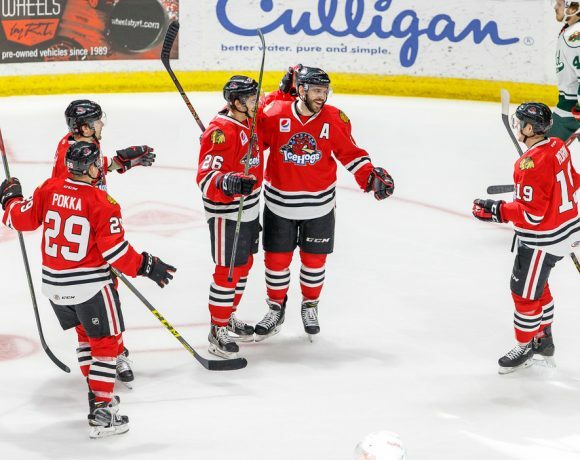 –Brad Mills, Maxim Shalunov, Byron Froese, Klas Dahlbeck, Adam Clendening and Dylan Olsen all racked up 3 shots on goal for Rockford on Saturday. -Rookie forward Maxim Shalunov made his AHL debut on Saturday night. –Jimmy Hayes made his IceHogs season debut, donning the no. 12—Kyle Beach’s old number—instead of his usual no. 17. 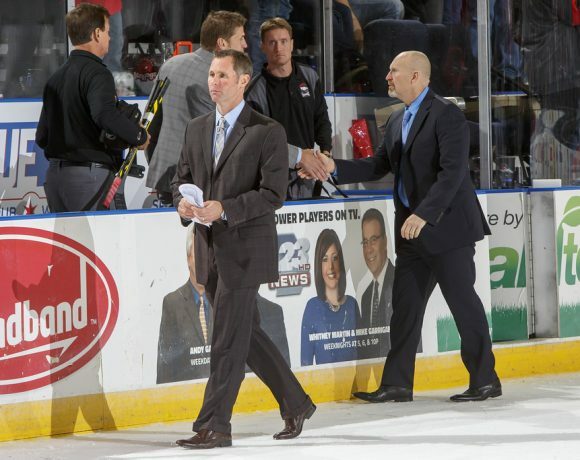 -The IceHogs’ scratches were: Wade Brookbank, Terry Broadhurst and Joe Gleason (healthy). -Friday, October 11 – The Blackhawks reassigned forward Jimmy Hayes to Rockford and recalled center Brandon Pirri. SIDE NOTE: I’ll be at the games on the 18th and 19th, so I’ll be live-tweeting them on my Twitter account: @kimwrona7.